4 Stroke outboard engine in well starts by hand. Here's a boat that will steal your heart! The Memory has a faithful following of enthusiasts who love the way she looks and sails. A traditional design with bucket loads of grace, the GRP hull lets you spend more time sailing and showing her off and less time caulking and painting. The current custodian has used her regularly around the solent and sails her two and single handed and loves how safe she feels and the fact she can float in a muddy puddle, perfect for getting away from the crowds. This example has been sensibly maintained and is currently out of the water for some maintenance, including fitting a new bowsprit. 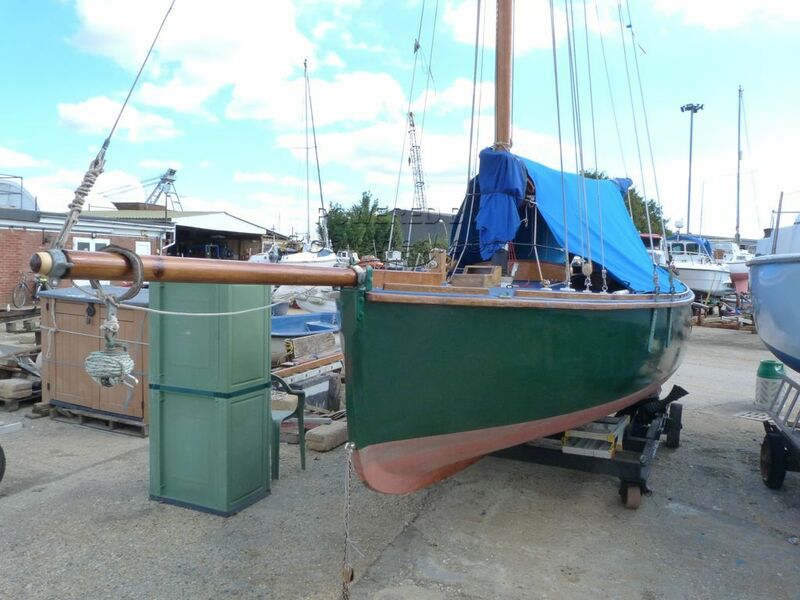 The current owner has tried to be faithful to her looks and has refurbished wooden blocks for her running rigging and kept the brightwork up to scratch. Despite her size, the cabin boasts two six foot berths although other facilities are a bit basic, but that's half the fun! She would make a great first 'gaffer' for someone who can appreciate her lines and looks or maybe you want to downsize to bring the fun back? For whatever reason this beauty has caught your eye, she is well worth a closer look. This Memory 19 has been personally photographed and viewed by James Gould of Boatshed Port Solent. Click here for contact details.